Heavy Duty and handles up to 30 papers per insertion. 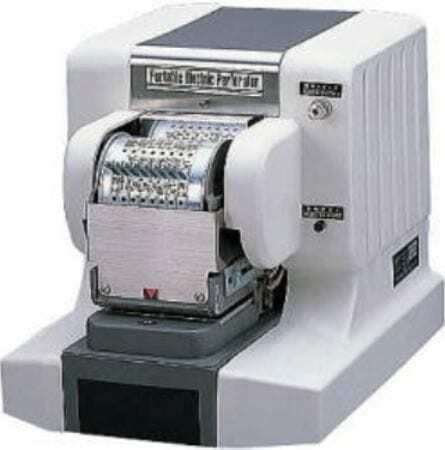 Perforating Machines provide that extra degree of document protection needed in today’s world. A full range of characters, dates, numbers, cancellations, logos & symbols are available for permanently marking documents and for numbering, authentication or security purposes. Your best protection for permanent and unalterable marking of documents - perforated holes can’t be erased. Applications include: Dating, Numbering, Cancelling, Receipting, Coding and Validating for Invoices, Documents, Claims, Check, X-Rays, Credit Cards, Badges, Passports, etc. Fast, convenient & easy to operate. Automatically perforates up to 35 pages per insertion. Attractively priced; costs less than other comparable electric perforators. Rugged Construction: made of heavy-duty aluminum alloy die casting. Completely enclosed gears and motor bearings are lubricated for life. All steel punches and die plate. Encased in a plastic case for economical pricing and shipping. Various styles and options available.